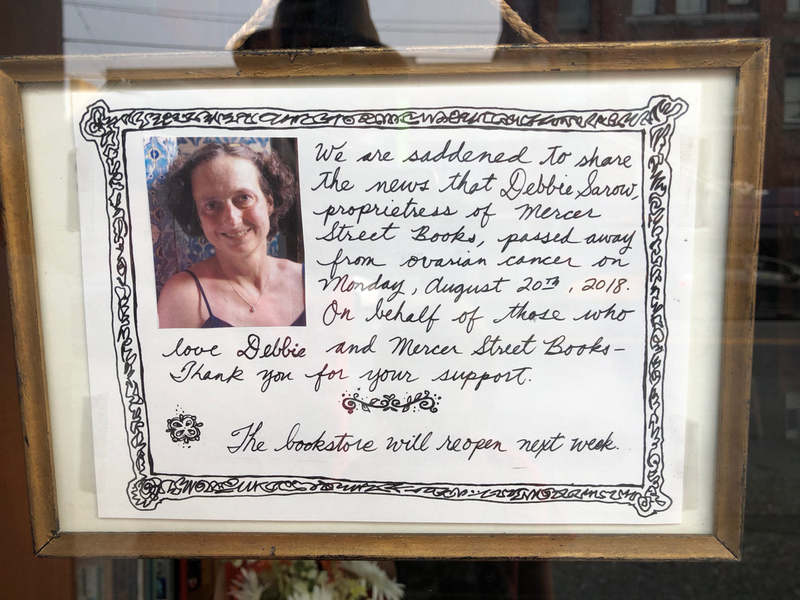 As noted on Tuesday, Mercer Street Books proprietress and owner Debbie Sarow passed away on Monday. The store is closed in memoriam this week, but will reopen on Tuesday. The sleepy little retail space — deeper than it is wide — at 10 Mercer Street has been a bookstore for over thirty years. Titlewave Books opened in the space in 1984. In those days what is now a Chase Bank on the corner of 1st and Mercer was Tower Books — a new bookstore with a big selection and the best-stocked magazine rack in town — so a used bookstore across the street was a nice complement. Titlewave was a good store — I recall attending readings there on more than one occasion. Rumor has it that August Wilson favored the little shop. Titlewave closed in 2004, and 10 Mercer was taken over as a branch of Twice Sold Tales, which brought in cats and their unique take on the trade. They lasted in the space for about five years. And then came Debbie Sarow. She bought out Twice Sold Tales, keeping the doors open during the handover, and began the transformation into making the store her own. She started with the name: Mercer Street Books. She painted the outside purple, and put up a sign that had a bird next to the logo. Her experience as a bookseller — from antiquarian and fine edition idyll Wessel & Lieberman, to many years running Twice Sold Tales just off Broadway (now an entrance to the light rail station) — gave her not only the kind of business savvy she needed to run a successful shop, but also the kind of experience that told her what kind of shop she wanted to run. She opened Mercer Street Books and did something that few people, and fewer businesspeople, manage to pull off: she created a community. I’m going to tell my side of that story in way of eulogy. But first, more about the store Debbie created. She was told, by some antiquarian dealers who advised her on the sale, that opening the store was a mistake, unless her goal was to lose all her money. I think it’s safe to say that, having been open nine years, she proved them wrong. Debbie had a magnificent eye for interesting books, and the shelves in the store never feel stale or laden with those volumes that lesser stores let mill about. There is always something new, the displays updated at least weekly, often daily; there is no cat dander or litterbox smell; no dust bunnies in the corners. Debbie had an obsessive attention to detail that shows in every angle of the space. The high shelves are lined with art and plants, the watering of which is just one of the many small details of upkeep. The antique card catalog in the front is always full of strange treasures. You'll happen upon unique shelf-talkers, some written by store aficionado and Seattle Review of Books writer Ivan Schneider, and little cards and signs hand-made by store employee and Seattle Review of Books artist Aaron Bagley (both of whom were introduced to me by Debbie). It adds up to a store with character and soul, a warm place where you could lose yourself in books for long periods of time. The number of customers who frequent her shop, and spend many a dollar there, is staggering. It is a sitcom of regulars, a revolving cast of the old — more than one resident of the Bayview Retirement Home make their slow way down to say hello on the regular — and the young — the store maintains a marvelous kids section, and never minds a restrained young book lover sitting and reading while their parents browse — who share one thing: recognizing how special and unique the shop is. I was one of those regulars from nearly the first day that she opened. I came in with low expectations — used bookstores are my favorite places in the world, but it is a rare store that delights me and pulls me back regularly. What I found at Mercer Street Books was always something unexpected and delightful. When my face became known, and she figured out my taste, Debbie would email me about a special typography book she had set aside, or the NYRB reprints of children’s classic. I didn’t buy all of them, but I would say I averaged at least 80%. Debbie knew her many customers, and she would scribble names and notes on index cards so that she could connect books with the people who would care about them most. She paid good money for the few books she was willing to cull from whatever you offered. I would often send her photos of stacks of books I wanted to sell (a precursor to our Mail Call column). She’d tell me which ones she wanted and name a price, knowing I kept my personal library in good shape, so the picture was enough for her to know what the deal was worth. I loved that we could do it by email, that it saved me hauling unnecessary loads and her leafing through things that held little interest or that she had multiple copies of squirreled away in some corner. Paying well for books means that people who collect and sell books come to her first, so the virtuous cycle of a well-stocked store starts there. And it is rare that a book lover selling a few boxes doesn’t leave with at least one or two new volumes. I know I did. Credit at the store, of which I’ve accumulated a fair pile, rarely lasted long. Since he was a newborn, I’ve brought my son into the shop. I would park his stroller near the kids section and hand him a stack of board books, and he’d be happy as a clam while I did my rounds and chatted with Debbie. By the time he was three, and proved he loved and treated books gingerly, he would trundle back on his own steam and make a small pile that I would re-shelf when he was done, all with Debbie’s blessing. Now, at eight, he heads for the comics and graphic novels instead, but the effect is exactly the same. “Dad, can we buy this?” Is the usual refrain, and with books, I almost always say yes. Wouldn't you, frequenting the shop you want to stay in the neighborhood so that one day he'll perhaps bring his own kids in? When I published my novel, my launch party was at the store, for which Debbie refused to charge me — she doesn’t sell new books, so wasn’t making any money from the deal (I did manage to sneak her a nice bottle of wine). It was a delightful evening for me, at least, and hopefully for the small crowd that came to celebrate. The glow of people sharing in something through those tall, folding windows has a storybook warmth about it, the kind of glow Hollywood would love to bottle. When Paul and I started this site, Debbie was one of our earliest boosters. As many of you know, Mercer Street Books is our mailing address, since we don’t have a physical office. I had known Debbie for years at this point, and had gone from being a customer to being a person who spent extra time in the store because chatting with her was always such a wonderful way to spend my time. I told her our plans, and then asked if she would be willing to be our mail drop. “I think the answer is yes,” she said, “but I never make any decision on the spot. I need twenty-four hours to think about it, and then I’ll let you know.” The next day she wrote to say she would be delighted. Pretty much every book ever shown in the Mail Call column has come through her door. The best thing about this arrangement was that it allowed me to stop by daily and see Debbie. While she was normally in the shop, occasionally there would be Aaron, with his son Baxter, or Red, or Jessica, or someone else minding the shop on Debbie's rare days off, which she often spent on house calls or estate sales. While at times Debbie was too busy to chat, or I was too busy to stay long, most nights were at least a ten-minute check-in about the day and the news of the neighborhood, of which she kept the pulse. Occasionally, when schedules allowed, I’d pass an hour or so — browsing and looking around while she would help customers — picking our conversation back up when their business was concluded. So it was that friendship sneaks up on you, accumulated in small visits and appreciations. You get to know the people in her life, and the yearly stories; the annual trips and holiday plans, the cadence of the book world. Spring list turned to Fall list, and the packages accumulating for us would rise and fall, but every day a "hello" would open a conversation that would end with a "nice talking with you, see you tomorrow." One of Debbie’s charms, to me, was that she was a unique person who found a way to focus her talents and idiosyncrasies into a home — a home for her, for the neighborhood, and for the people who loved her and what she created. I am certainly one of those people. And looking back on that friendship that snuck up on me, I am heartbroken she is gone, and don't know if I quite realized how important she was to my daily life. I am so glad I got to know her and call her my friend. I’ll be forever grateful to her for what she did for me, and this site, and the graciousness and ease that she seemed to bring to all of those deals, as if her giving was all a favor I was doing for her. But lest I make her into some kind of pushover, which I think she would roil at, she also did well from our bargains and deals. She made money on them — otherwise, why would she do it? She ran her shop so well that you would do business with her, and you would both smile, and you would both get something out of the deal. That’s the art, after all. That’s how you prove the sour antiquarians wrong, that in this day and age of internet sales and ever-fluctuating bounties on the collectability of a single title, you can make a place that people want to come to, want to stay in, want to leave their money with. Debbie was many things, and chief among those was a deliberate, and savvy businesswoman. Perhaps she may have made more if she cared less, but it was the care she brought that made the money mean something. My thoughts and grief are with Debbie’s loved ones; for the community she created, which is so far the worse for having her gone, but so far the richer for having her as its creator and benefactor. I’m thinking of her partner Oscar, of Aaron, and Red, and Jessica. Of Ivan and the other familiar faces I’d see spending time whenever I came in. As I’ve been telling my son all eight years of his life: “Hey, I need to drop by Debbie’s. Let’s go say hi. Who knows what we’re gonna see?” And then we’d pull up and there would be her tan bike bolted to the rack outside, the bike she rode each day to and from her home in Ravenna. We knew we could go in and spend a little time, and catch up, that we were in a place we felt connected to and welcome in. It's going to be hard to go and not see that bike anymore. Its absence is going to be a reminder of hers. It was one thing I noted the other day, when my son and I went to leave flowers at the door. Goodbye, Debbie, and thank you for everything. Goodbye, and thank you for the people you collected and made family. I’m so honored that I got to play my own small part in your story. Looking outside, at this writing, at the ashen sky seems fitting, an atmosphere flown at half mast in your city. I love you, my friend, and I’m so grateful to you and everything that you so carefully, deliberately, and lovingly created in this world. Goodbye.